Thursday. I'm off. 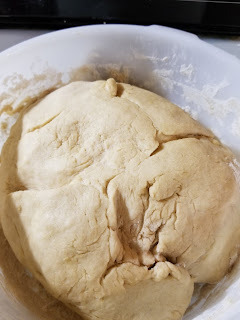 Blog's a little late today because I'm baking bread today. I'm also going to go see my Mom this afternoon before my bicycle ride. That means the bread needs to rise twice and be baked before 1 PM. I also did free weights this AM. Hoisting the dumbbells around always takes at least an hour. I saw where Vlad wants a summit with the Idiot Jerk in the White House. My first thoughts were that he's not too happy we're pulling out of the Iran Nuclear Accord. The last thing anybody wants is for Israel and Iran to nuke it out. Later I saw something in Bloomberg which pretty much echoed what I'd been thinking. Foolish Vlad. He thought having the Idiot Jerk in the White House would make his life easier, instead things are now much more complicated. Vlad failed to realized that the Idiot Jerk would surround himself with Ultra Right Wing sycophants more interested in policy that was not at all conducive to Moscow's wants. Instead of getting a surrogate satellite nation he got John Bolton. Oops. And the Michael Cohen story keeps getting worse and worse. Selling access to the White House? Dear me.... Why is it that every time someone turns over a rock near the Idiot Jerk we find more corruption? You can bet that if there was payola in it for the Idiot Jerk, he was involved. On the three Americans who were released by the North Koreans? Conservatives are lauding praise on the Idiot Jerk - that guy is such a deal maker, isn't he? Sadly for them, he's just a pony prince. The force to be reckoned with here are the Chinese. Of course, that's not stopping the Republicans from sucking out all of the credit they can. Do they understand? That's very doubtful. Just like the North Korean nukes. There's an Idiot Jerk supporter at work who was reveling in a nuclear free North Korea, and how his president was responsible. Duh. People are so damn stupid. North Korea's power isn't in their nukes... it's in their hackers. "Oh, no, no," Republicans say, shaking their heads, "it's the nukes." Remember the Sony hack? That was easy pickings. Conservatives still don't understand. "The North Koreans are that sophisticated," they whine. Just wait. Anyway, one of the Itoh peonies I planted has finally started to stick it's head out of the ground. I'm so happy. Now all I have to do is wait for the other two. It's is usually fun to make things rise. between you and maddie...the two of you have the spring hornies!